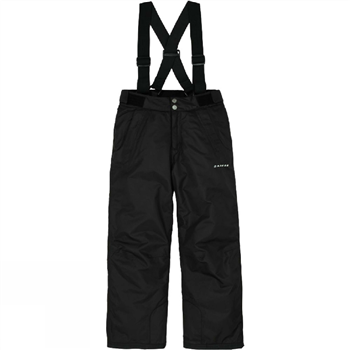 The junior Whirlwind Pant from Dare2 is a great entry level snow pant with modern, fuss-freestyling and reliable all-weather performance. They're built using ARED 5,000 waterproof and breathable coated fabric with fully sealed seams and a soft polyester lining. The braces and waist can both be adjusted for a comfortable fit and the legs are finished with inner gaitors to keep the powder out. 100% Polyester. 2 x zipped side pockets, Integral snow gaiters ,Grow cuffs at hem , Reinforced binding at hem, Tab up hem. Waterproof - Dare 2b's Ared fabrics are guaranteed to keep the wet out. Breathable - When you are active and working up a sweat Ared fabrics will ensure your body doesn't cool down from stale trapped sweat by allowing moisture to escape. Water Repellent - All jackets and overtrousers are treated with a water repellent finish so the water simply rolls off and won’t retain moisture. Windproof - Once the wind rolls in a sunny day on the slopes can turn cold in a flash. Ared fabrics are designed to be windproof so you can't feel the chill.